Sometimes you write an article that really hits a hot button and the feedback is tremendous. 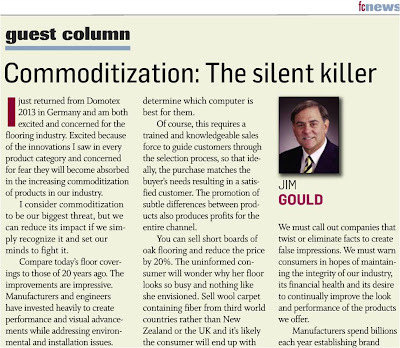 I've written about commoditization and the threat it poses to the flooring industry before but my most recent article written for Floor Covering News, Commoditization-the Silent Killer, has generated a lot of attention and discussion. Even Steve Feldman, Floor Covering News publisher, referred to commoditization as the new "c" word " when he wrote about "everyone and their mother attempting to join the party with their version of click systems." I wanted to share it with our readers and get your feedback. Here is the article just as it appeared in Floor Covering New's January 21/28 Surfaces issue. I just returned from Domotex 2013 in Germany and am both excited and concerned for the flooring industry. Excited because of the innovations I saw in every product category and concerned for fear that they will become absorbed in the increasing commoditization of products in our industry. I consider commoditization to be our biggest threat but we can reduce its impact if we simply recognize it and set our minds to fight it. Compare today’s floor covering to those of 20 years ago. The improvements are impressive. Manufacturers and engineers have invested heavily to create performance and visual advancements while addressing environmental and installation issues. Has the industry seen increasing profits and strong returns on the investments made to create improvements? Not really. As a whole, our industry has a habit of commoditizing uniqueness into a blur behind the ever increasing focus on price. The result is more consumers dissatisfied with an underperforming floor, manufacturers struggling for differentiation and an industry as a whole scrapping for profitability and return on investments. It’s a sad commentary when all of the hard work, money and commitment to excellence made by our industry leaders are often boiled down to the lowest price per square foot. When we advertise “oak floors for just $0.99“ or “laminate floors for $0.49”, as anyone can find on the Internet, it creates the perception that all oak flooring or all laminate is the same. In the absence of information, price becomes the only differentiator and that’s all the consumer has to go on. We’ve done this to ourselves. You don’t see major electronics retailers advertising “laptops for $299.” Why? Because they explain to the buyer how small differences in specifications make a significant difference in performance, thus justifying different prices. They walk the customer through a process to determine which computer is best for them. Of course this requires a trained and knowledgeable sales force to guide customers through the selection process, so that ideally, the purchase matches the buyer’s needs resulting in a satisfied customer. The promotion of subtle differences between products also produces profits for the entire channel. You can sell short boards of oak flooring and reduce the price by 20%. The uninformed consumer will wonder why their floor looks so busy and nothing like they envisioned. Sell wool carpet containing fiber from third world countries rather than New Zealand or the UK and it’s likely the consumer will end up with more fuzzing and matting or the color may be dull or different than they selected. Sell soft bamboo and the consumer will end up believing that all bamboo floors scratch and pit. I am not saying that we should not have a range of product qualities but the consumer must know why one floor costs more than another. Marketing material and labels often carry the message of unique properties. The retail salesperson is the gatekeeper who must explain and demonstrate these differences. If unsuccessful, they often resort to dropping the price for fear of losing the sale to the discount store down the street. Without an understanding for price differences in similar looking products consumers will consider their challenge s to get the lowest price rather than finding the right flooring solution for their needs. I am not suggesting that we stop advertising prices. However, price wars are a competition our industry should not enter into against the likes of commodity sellers like Home Depot and Lumber Liquidators. Instead we should be running advertisement with large warning labels: “Warning – There are major performance differences between various flooring products. BEWARE of companies advertising generic floors at low prices. Learn about the differences to make your home beautiful.” As an industry we cannot abdicate to the price only sellers. We must call out companies that twist or eliminate facts to create false impressions. We must warn consumers in hopes of maintaining the integrity of our industry, its financial health and its desire to continually improve the look and performance of the products we offer. Manufacturers spend billions each year establishing brand awareness and creating innovative products. Distributors invest heavily in logistics and sales forces to inform retailers of the benefits and differences of one product over another. The retail showroom is the best place to educate consumers, yet squeezed margins and cutbacks in staff and training budgets have left a shortage of well-trained professionals. If we hope to survive we must refocus on education and communication with our customers. Laminate is a good example of commoditization and its results. A product that was once retailed at $4.99 is now being sold under $1. Everyone questions how long it will take for today’s LVT to suffer the same squeeze. I am not advocating that we fix prices or charge more than is fair but rather stressing that consumers must know what to expect and what they are buying. Two of the most exciting innovations at Domotex were an inert core board made of bamboo and wood dust with an attached LVT top, and a few locking systems designed for vinyl rather than adaptations of laminate click systems. These great new innovations offer wonderful benefits to consumers over existing products. And accordingly prices should reflect that. But how will consumers learn why these new innovations may cost more? Not through those people selling laminate floors for $0.49; they are simply focused on making a sale. The rest of us need to focus on education and satisfying consumers to ensure the continued growth of this wonderful industry. How's Your Website 'About Us' Page? The Floor Covering Institute Blog brings you insights, perspectives, best practices and resources relevant to the global flooring industry all from seasoned and recognized flooring industry experts who have owned, operated, and served flooring businesses in every tier from manufacturing to retail buying groups. Will you join us as we discuss ways to improve this marvelous industry?